In honor of Courteney Cox's birthday on June 15, The Huffington Post has pulled together 11 obscure pieces of trivia about "Friends," and everyone's favorite chef. 1. Cox was a neat freak just like Monica and would clean the others' dressing rooms. "Let's face it, she's adorable and intelligent and really together. She is Monica," show co-creator Marta Kauffman told the Los Angeles Times in 1995. "She has the neatest dressing room. She even cleans up the other actors' dressing rooms because she won't go in there if they are too messy." 2. In fact, the actors pulled straws for the bigger, better dressing rooms. A 2000 cover story about the series in People magazine revealed that the cast "actually drew straws to see which actors would get the two larger dressing rooms, and the prized suites are rotated annually." An earlier article that ran in Rolling Stone in 1995 also mentioned the cast's dressing rooms. In particular, their proximity to the "ER" dressing rooms of George Clooney and Noah Wyle. According to Rolling Stone, "the good doctors ... have personally defaced the signs on the doors of the 'Friends' minuscule, windowless dressing rooms." 3. The actors were rumored to have signed an agreement to not sleep together. In 1997, Elle brought up in their story about Cox "a recent rumor which had all the actors signing some kind of agreement that they wouldn't sleep together." When asked about this, Cox laughed, saying: "Ha ha, there's no pact, there's never been a pact." 4. Although, Lisa Kudrow once joked that the cast only became close after they all slept together. In a 1996 Us Weekly cover story, Jennifer Aniston, Lisa Kudrow and Courteney Cox were asked what would happen if the male cast saw them naked. Cox said, "They wouldn't care," while Aniston joked they'd care almost too much and run to the "their little rooms and go, 'Oh. My. God.'" Following up, Cox said that they'd all become like brothers and sisters, to which Kudrow joked, "You mean after we all stopped sleeping with each other?" 5. The writers used a pie chart to track how many lines and jokes each character said, to make sure each actor had the same amount. That aforementioned People cover story mentioned "a pie chart" that "was once posted in the writers' room to ensure that all six characters got the same number of lines and jokes, but now such fairness is taken for granted by the cast and crew." 6. Cox had a special place called "Courteney's Candy Cabinet" on the "Friends" set. A Natural Living Today story from 1996 claimed Cox was "once famous for scarfing down junk food from an on-set cache called 'Courteney Candy Cabinet.'" Butterfingers were a particular favorite. Us Weekly's cover story from the same year claimed that Cox was "addicted to candy bars." The actress proudly stated, "my first choice would be a Butterfinger." 7. Matthew Perry, Matt LeBlanc and David Schwimmer played video games between takes. According to People, "The guys battle it out playing Super Mario during breaks." 8. Paul Rudd got the part after the casting director just wrote one word during his audition: "Dreamy." Casting director Leslie Litt spoke to The Huffington Post about casting Rudd. "Paul Rudd was someone who was on a short list for the role of Mike," said Litt. "We had a casting session for that role but no one was quite it. Paul agreed to do a one-time meet and read with Lisa [Kudrow]. All I wrote on my notes was 'dreamy'!" Litt also told HuffPost that Paul McCartney almost had a role in the show. 9. The actors, led by David Schwimmer, held an "intervention" for Jennifer Aniston because of her lateness to the set. "The boys did an intervention with me about my tardiness," Aniston said in the Us Weekly story. "David did it. Very kindly. The day my alarm didn't ring." In response to Aniston, Kudrow said, "You've had bad luck getting to work." Aniston said that David did all of this lovingly, but said that "the boys" and him had discussed that "the girls" are always late. Kudrow explained this was because they had to get ready beforehand, while the male cast members just rolled out of bed and went to set. 10. Kudrow was considered the smartest by the other actors, despite the "ditzy" character she played. Us Weekly noted that Kudrow "would seem to have nothing in common with Phoebe except the way she delivers one-liners." Describing her as an "academic wiz," Us Weekly also quoted Cox as claiming Kudrow was "the smartest person I know." 11. 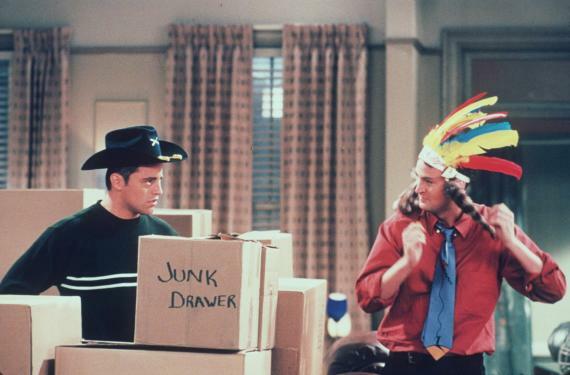 Even before they became a couple on the show, Cox said that if Monica had to "do" a Friend, she would choose Chandler. In the Elle profile from 1997, Cox was asked "if Monica had to 'do' another Friend, which would it be?" Her answer? "Chandler," because in her mind, the character's sarcastic bite was similar to Monica's. The two characters eventually hooked up during the Season 4 finale in London, almost exactly a year after the quote was published. Season 2, Episode 7: "<a href="https://www.youtube.com/watch?v=2Q8X64j4P7Q" target="_blank">The One Where Ross Finds Out</a>"